Hello and welcome to Bad Wolf Barbecue Catering, home of smokin’ hot food and nice folks too! Our story began when the award-winning barbecue team of Bad Wolf joined forces with Harper’s Southcountry Foods, a catering outfit with 30 years of experience. This unique combination allows us to provide seamless service and satisfying pre-selected menus or, if you’d prefer, we can work together to create the barbecue you’ve been dreaming of. Check out our Awards page for the prizes we have won over the years, to find out just how good a Bad Wolf event can be! Our chicken and ribs are slow smoked for hours over a variety of woods and charcoals before we sauce them up and put them on the grill. We use only genuine Alabama smokers to give your meal a rich, hearty flavour. Our events are a feast for the eyes as well as the palate – we look good so you look good! From our ‘country club’ cabin rigs to our clean-cut, cheerful staff in bright Bad Wolf shirts and aprons, we make an event an event, with the sizzle and spark of a ribfest! We are flexible enough to accommodate 50 to 5000 people. 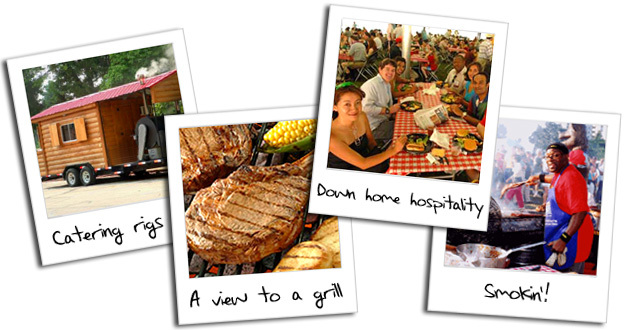 From a class reunion to a corporate picnic, we provide the same care and enthusiasm for large and small groups alike. If you’ve got a mouth, we can put a smile on it!